On my trip to London on what must be the hottest day of the year so far, even though it’s now about 7 o’clock in the evening it’s still really warm and here I am wearing a suit, carrying luggage and chasing across the capital to visit Westminster Library, to see collages by John Bunker in the show Six Fugues, curated by Sam Cornish. The moment I set eyes on them I know the effort was more than worth it. I have seen one of these in reproduction and liked it, but seeing them here for real is so much better. Why is it that not being able to hold them in my hand and perceiving the depth of the supports and the proper sizes makes a difference? Also, that they have weight, they are on MDF rather than paper, (no glass – excellent), adds to the sense of their physical presence. 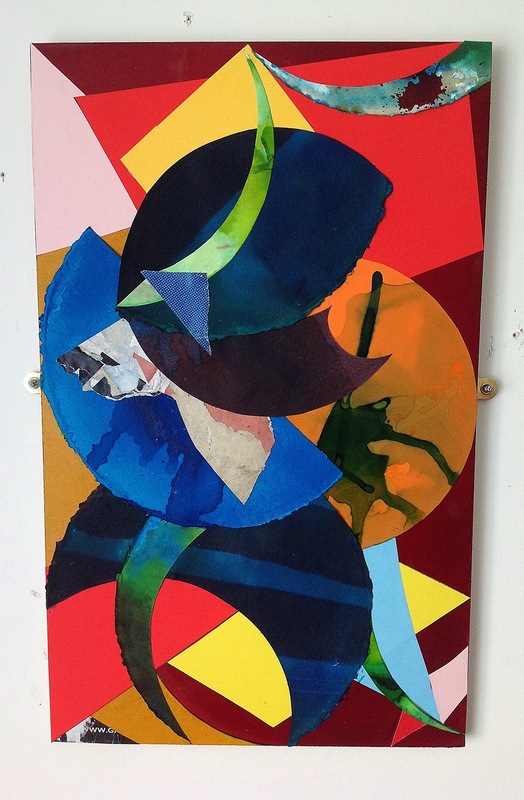 That, as well as the stuff they’re made from, “torn posters, shattered CDs, abandoned chicken-shop boxes,” combined with the painterliness of the gestural flourishes, even in collage there are plenty of those, all adds to their materiality. Nevertheless, I can’t help but think of them as paintings, the construction method of which is collage, rather than collages made with painted elements. In the exhibition notes Sam Cornish reminds me that collage is a century old, and the many library books open at appropriate pages assembled on a table and in a display case connect Bunkers work clearly to this tradition, a reproduction of Kurt Schwitters’ The Hitler Gang from 1944, having immediate resonance, for me, with Bunker’s Falling Fugue with it’s strong triangular figure and concentric circle motif. As in other works here, the figures(torn and cut shapes and gestural painterly marks), seem to occupy a fairly narrow cubist space, blues often being interpreted (by me at any rate) as sky, which sometimes opens up into a much deeper space than I was first perceiving, especially in Shady Hill Fugue where the blue plane on the right hand edge becomes as sky seen beneath, but also beyond, an archway suggested by an arc in sandstone ochre, possibly the MDF support. 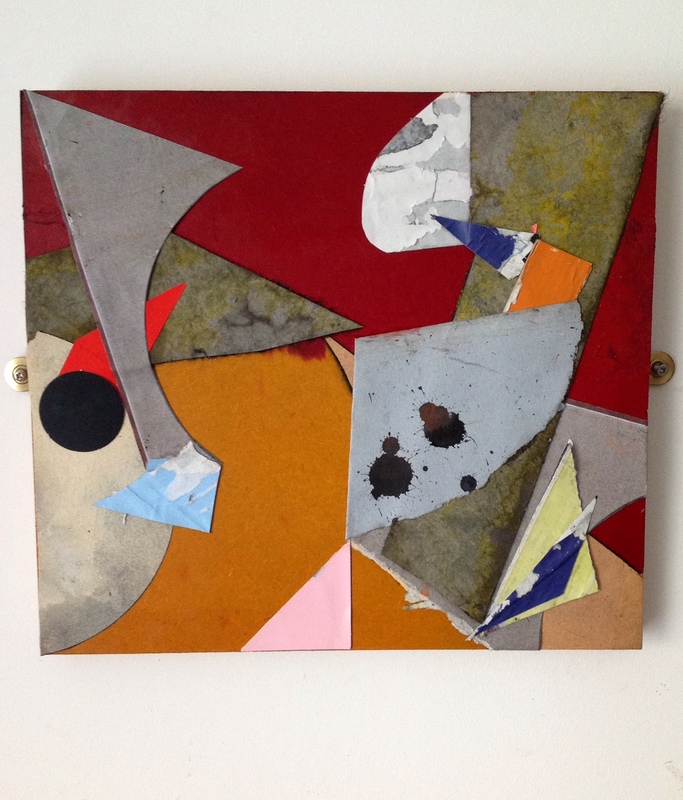 A triangle of a similar colour inserts itself at the bottom right hand corner which is different enough tonally to bring it forward of the darker and more saturated central ochre colour, allowing the other shapes to dance within the space created. I say dance because they seem ungrounded, there’s no sense of an earth or floor other than the bottom edge of the support. In Falling Fugue the obstructed blue circle along the left edge doesn’t quite become open space, unless I focus on the bottom half of the work and then the blue area does seem to recede further than when I have the whole image in view. My eye seems to be taken downwards, I guess it must be because of the strong direction lines, pointing towards the lower edge. I do indeed get a sensation of things falling. Also, I feel that I may be looking slightly upwards, as if I am nearer to the bottom of the frame, whereas in Night Fugue it’s the other way around, enhanced in the photo by the downward angle of the shot, but still taking place when looking directly at the picture. 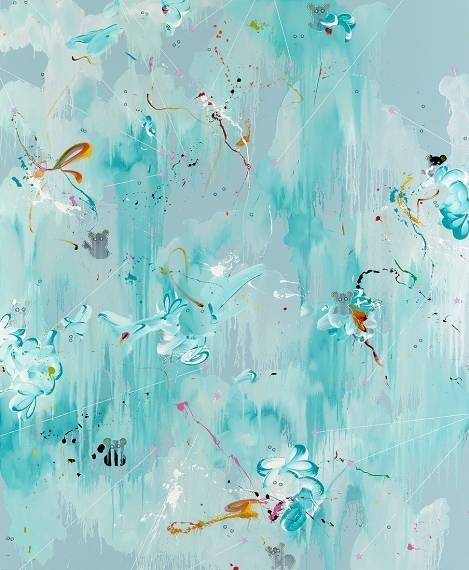 Here the light blues and greys also sometimes become infinite space against which the flatter coloured areas jut forward or within which ink splatters become forms. 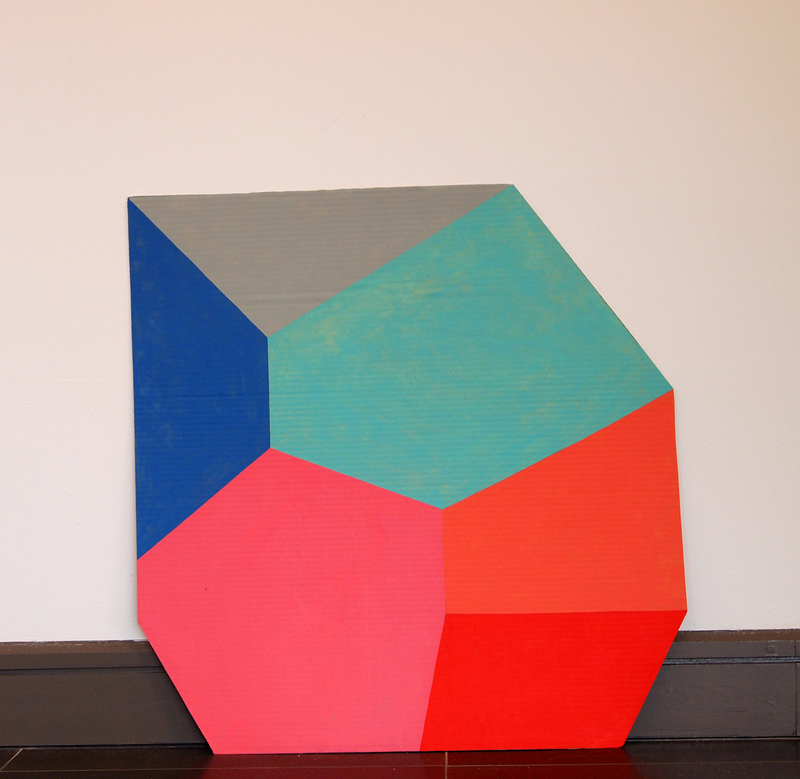 Then the arrangement shifts so that the large flat area of red becomes a plane in front of which ochre, green, orange blue and grey cut outs jostle or float. 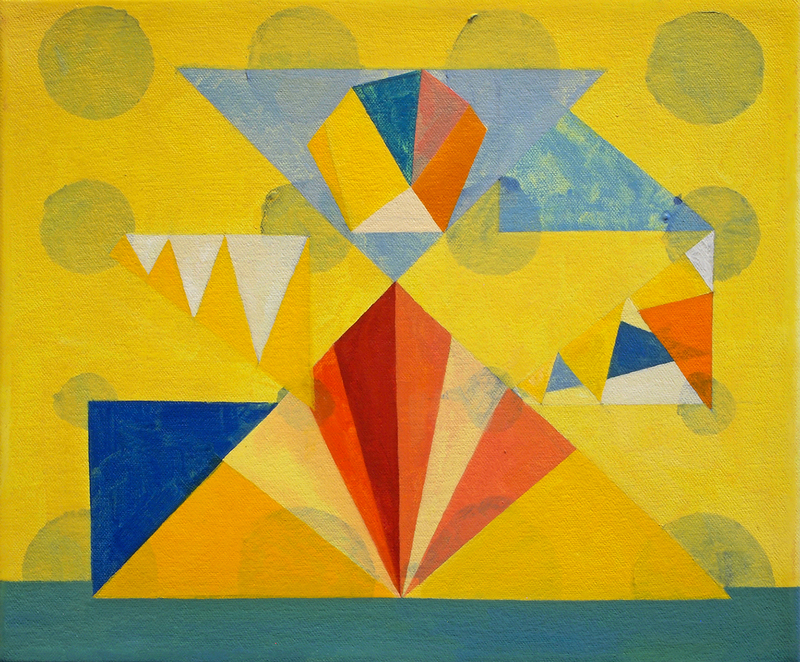 The pink triangle at the bottom edge positions itself in front of the ochre but behind the grey/blue pentagon, in front of which a pale yellow triangle hovers, itself obstructed by a dark blue shape that is echoed higher up. And then, of course, they are simply torn papers (etc) randomly assembled on a flat surface. I get to wondering about how much randomness there is in Bunker’s process, I imagine him scattering this week’s finds across the floor and then frenetically rearranging them. What do I know? His method may be quite the opposite of that. Looking in other library book reproductions, I see similarities also in Cubist works from 1913 or 14, especially perhaps Juan Gris still-lives, with extensive use of collage and creating similar pictorial spaces as these I see in this show. What seems different though is the continued link in the still-lives to representational content. However much a Picasso, Braque or Gris still life is ‘abstracted from’ reality it still maintains that connection, I can recognise a guitar here, a rum bottle or a fragment of newspaper there. 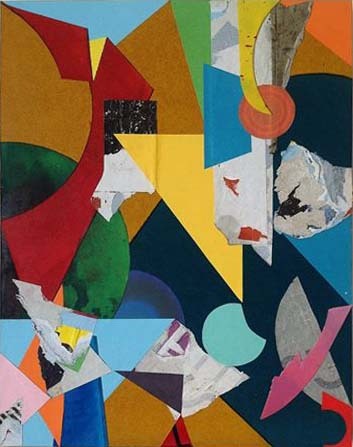 In Bunker’s work such elements are almost completely absent, and where for example, a fragment of newsprint or a star motif might be recognised they seem accidental. The overriding similarities however, might be in the method of composition, according to rules, that are indeed abstract, in the same way perhaps that the strict laws of counterpoint and fugue in music are abstract. “…from pale harmonies of colour lines ascend, prisms shoot up, advance towards us or jump backwards, cutting steps out of the infinite space…They multiply, cluster into chords animated by the rhythm, executing their dance against the backdrop of that absolute music which is space. One experiences this transcendental dynamism no differently from the counterpoint of Bach’s fugues, so far removed from reality”∗. And I say “most of the following words” only because “pale harmonies of colour” understates the power of the colours in Bunkers fugues, and also I don’t really find “prisms”, his shapes are flatter that that, as indeed they often were also in the collage still-lives of Gris. If that modernist innovation collage is 100 years old, so also is the tradition of speaking of visual abstract works in terms of the musical structure of the fugue. Whilst allusions to fugue are only occasionally found in nineteenth century writings about art, they abound in the early twentieth century, the dawn of abstraction. Kandinsky entitled a 1912 painting Fugue (Controlled Improvisation), and by the 1920s lots of artists were doing it, Paul Klee and Josef Albers, amongst them. In a fugue, one instrument or voice follows another echoing note for note the initial tune, as in a ’round’, the voice that enters last reiterates the opening melody (the fugue subject) whilst the preceding voice carries on with its own independent tune (the counter subject), with three or more parts the same process is repeated several times, amazingly the voices fitting together and making sense in ‘counterpoint’. There are usually three sections: an exposition, a development and a recapitulation. Melodies might be repeated backwards or upside down or played again with doubled or halved note values, and counterpoint intervals may be varied. Such a structure can easily be translated to the visual modality, a figure being inverted, rotated, mirrored, drawn back to front, etc and it all exists simultaneously in the same space. Hence its attraction perhaps for visual artists, and specifically for abstract artists because the structure is entirely formal, no rushing water, no bird song, no bell ringing, no Wagnerian images. So, for example, in John Islip Fugue, we get arcs and circles each echoing another, in similar and contrasting hues, impossible now to tell which one was placed first, and rectangles that may have been rotated and layered one over another. What I am not sure about is just how systematic Bunker’s method is, the extent to which the fugue is a strict compositional device or whether it’s a fairly loose metaphor. I suspect it is the latter. Another attraction of the fugue for abstract artists is that it offers a structural method that offers an alternative to more arbitrary approaches and it appeals more to the intellect than it does to the emotions (though we shouldn’t overlook the emotional impact) . 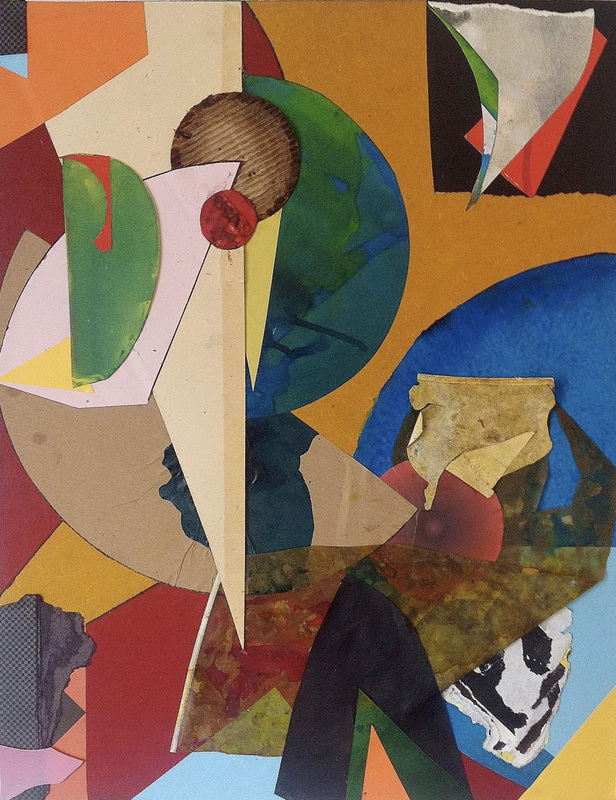 The Constructivist tradition comes to mind for me now, with its own take on collage, structure and fugue-like systems of rotation, repetition, inversion, etc. but I will leave those reflections for another day. Enough now to say that Bunker’s six fugues are a delight! 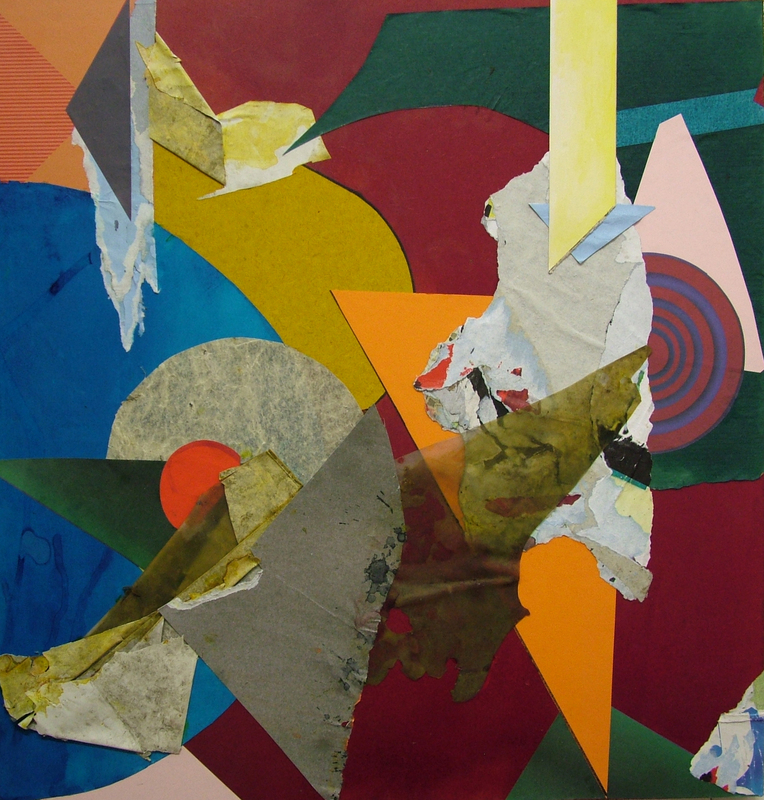 Six Fugues: New Collages by John Bunker was showing at Westminster Library between 1 July and 19 July 2014. The Long Gallery at Nottingham Castle Museum and Art Gallery is an excellent setting for sixteen marvelous paintings, seven by Dan Perfect and nine by Fiona Rae. In the adjacent room there are some smaller works on paper by Perfect and collages by Rae along with a video about their respective practices. Curated by Tristram Aver, this must be one of the best shows I have seen in Nottingham for a long time, though we are doing well this year, a Tess Jaray exhibition having just finished at Lakeside and Somewhat Abstract continuing at Nottingham Contemporary until 29 June. In London, almost a year ago I saw small paintings by Rae and Perfect in a group show at the Lion and Lamb Summer Saloon, and when, around that time, I also heard that the Nottingham show was being planned I thought that the two would make a brilliant combination, not knowing then that the artists are in fact married to each other. I had been impressed by the Dan Perfect painting Operator, and much of what I admired in that little painting I am seeing again here at Nottingham Castle only on a much larger scale. 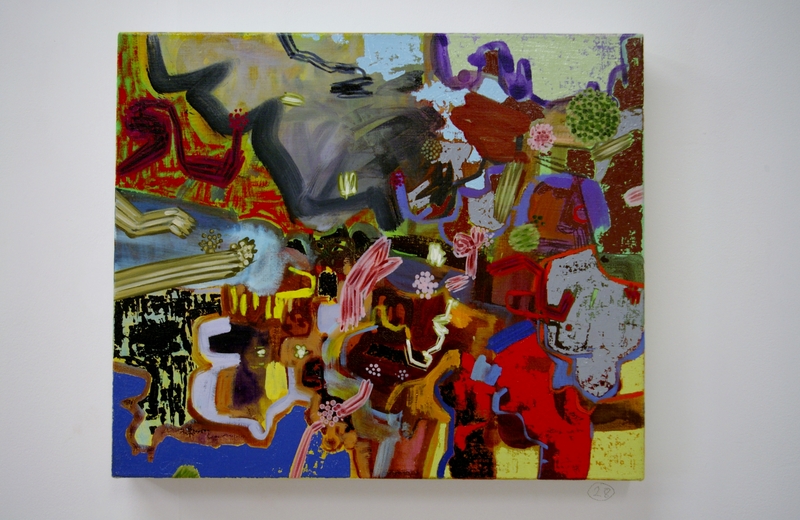 I wonder if the operator in the title is the artist, acting upon the materials of canvas and paint, or maybe even the painting itself as it operates upon me the viewer, changing my experience, visually and psychologically. Likewise, the huge painting Transporter, here at Nottingham Castle, affects me, taking me somewhere, similar to the way that a dramatic natural landscape might act upon my gaze, as if I were a passive observer, transported even to some ‘spiritual’ place, when in fact I am the one who is actively constructing the world I see. I am the operator, the transporter or the Generator, another of the paintings here. 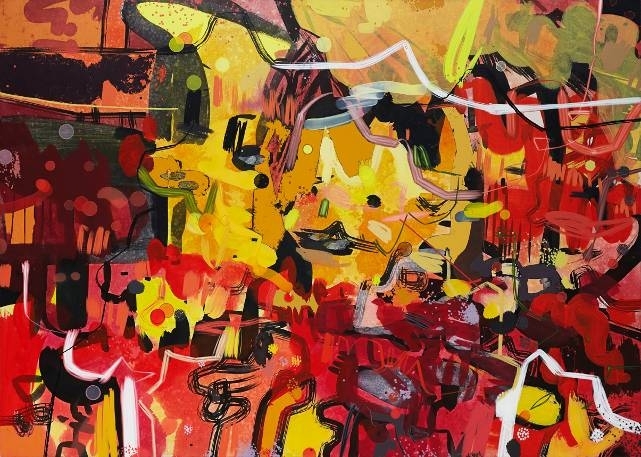 Then again, maybe the motifs, figures or gestures within each of these paintings take on such agency, painted marks or patterns first creating spaces that they then inhabit. In Generator clusters of atom-like, circular forms, seem to hover in spatial crevices, but take the motif away and no space is now perceived. In Transporter a blue disc atop a meandering line could be read as a wheel travelling along a highway, without the disc the line wouldn’t be a highway and without the line the disc would not seem to travel. Once the highway association has been made I am cued to read the rest of the painting as landscape, with trees and mountains perhaps, even whilst knowing full well that no such landscape has actually been described. Whilst I may be paying too much attention to the titles and not enough to the objects themselves, I think Perfect chooses his titles carefully, so that when I come across a painting entitled Laocoön or another entitled Cerberus, surely I must be expected to think of, in the first case, the famous statue in the Vatican Museum, and its reference to Greek mythology, or, in the second, of the mythological, gigantic three-headed, creature guarding the gates of Hades. And in viewing the painting Cerberus I start to think that the central white shape might resemble a head of the dreaded creature, and then to wonder what might be guarded, i.e prevented from getting out of the painting into the external world, or vice versa. And even as I am talking to myself about this. I hear Perfect speaking on video about his paintings being abstract in the same sense that mathematics is abstract, i.e. existing in its own tautologous world. Noting the title Laocoön, I cannot help but bring to mind the article Towards a Newer Laocoön by Clement Greenberg in which he made his (in)famous case for value in abstract painting based on medium specificity. Martin Herbert makes this connection in his essay in the excellent catalogue for this show. He also reminds us, if reminder were needed, that Perfects painting Full Fathom Five, borrows its title from Jackson Pollock‘s 1947 painting of the same name. In Pollock’s famous painting we find bits of the ‘real world’ embedded into the surface, objects such as nails, thumbtacks, cigarette butts, coins, buttons, and a key. The ‘real world’ has changed a lot since 1947, one massive change being the rise of the computer and digital media. 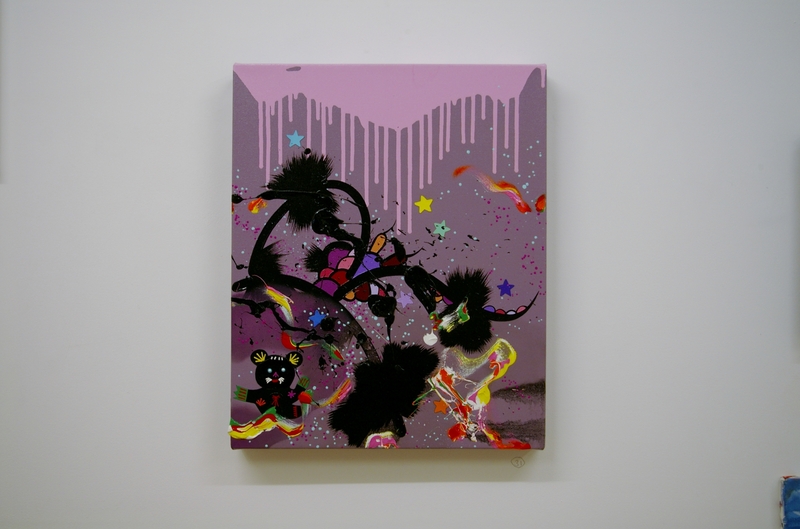 Could it be said that embedded in Perfect’s painting are bits of the virtual world, using as he does in his practice, Photoshop to manipulate sketched material, a hard copy of which he then uses as a ‘score’ for the paintings? The digitized image finds its way into the painting. In Full Fathom Five a swirling gesture in the bottom left hand corner changes colour abruptly halfway through its stroke, it looks like a digital edit. Similarly, the very fine circular doodles in Transporter look a lot like digital doodles. I have the sense that I am witnessing a visual conversation between the digital and the analogue. I think I find a similar dialogue taking place in Fiona Rae’s paintings, only here the digital seems to be referenced more in the synthetic colours and the insertion of manufactured collaged elements from childish popular culture, girly stationery, stickers of cute cartoon pandas, her now familiar mixing of crass pop decor with the tropes of Abstract Expressionism, that continues to have the power to jar, entertain, and provoke. If Perfect’s paintings resemble landscapes Rae’s are more like full-figure portraits, at least in their orientation, there is something person-like in their physical scale, but optically it is space that seems to be portrayed. Both artists open up spaces that appear cosmic, Rae’s to an even greater degree, her choice often of blue hues, the inclusion of stick-on stationery stars and her tracing direction lines from their points all add to this impression of the stellar. Rae’s has an amazing facility with paint, her dramatic swooping gestures look effortless and also delightfully intricate. There’s something Rauschenbergian about them in their faux authenticity, yet with playfulness and a much greater sense of enjoyment than in Rauschenberg. Rae seems to revel in the contradictions of technological culture. The suggestion of personal expression and subjectivity yet also its knowing denial. Her inclusion of geometric motifs, references also the Constructivist strand of abstraction, acknowledging both its promise and its failure. Am I indulging my imagination too much seeing in these paintings a hint at a new vision, an acceptance of where we are now, tentatively hoping for a future that is more than parody, irony and the feeling of being stuck? In the painting See Your World, a synthetic sky is populated by squiggles, gestures and apparently decomposing cartoon pandas. It’s high-tech Abstract Expressionism-meets-Manga, that I think does reflect the contemporary east/west, post apocalyptic, almost sci-fi world we now inhabit, without quite representing it. Just as the pandas appear both cute and sinister, the technological future might seem both attractive and menacing. I am reminded of the small painting by Rae that I saw at that Lion and Lamb exhibition, Party Time is Coming, it might even be here already, and it’s not necessarily a good thing, even though I do think Rae’s paintings are a very good thing! 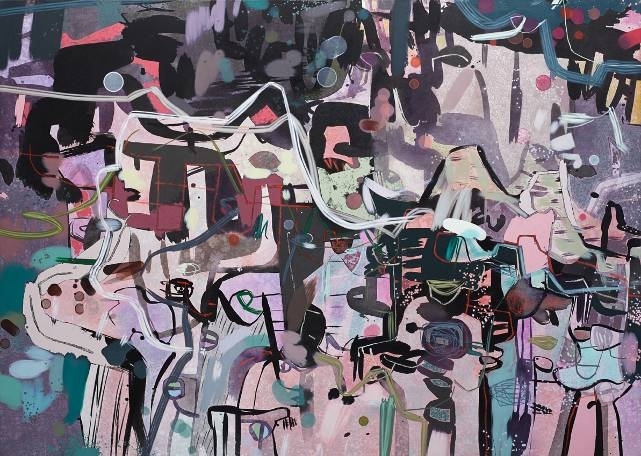 Dan Perfect and Fiona Rae’s joint exhibition, ‘Painter, Painter: Dan Perfect, Fiona Rae’, is on show at Nottingham Castle Museum and Art Gallery from 3rd May to 6th July. 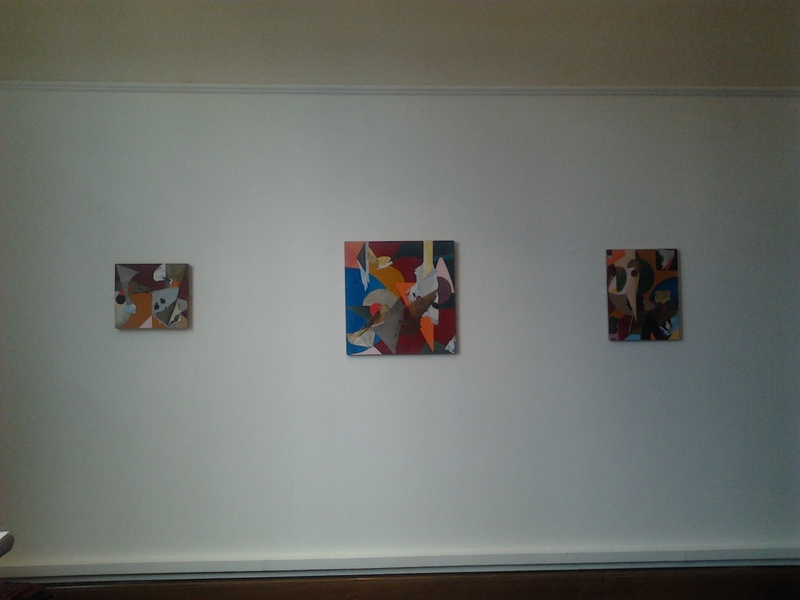 The exhibition, will travel to Southampton City Art Gallery 18th July to 18th October. Mrs Rick’s Cupboard exists in a time warp. Once the teacher’s cupboard in a Nottingham primary school, now somehow out-of-place, functionless, in the corner of artist Craig Fisher‘s studio at Primary, Nottingham. No longer a stock cupboard, it serves as an exhibition space that seems larger on the inside than on the outside. At least that’s how it appears to me as I view paintings by Louisa Chambers in this setting. And having created that filter for seeing the work, doesn’t the background of Tent resemble the interior of Doctor Who’s TARDIS, depending on whether you are seeing the spray painted circles as positive or negative shapes? When they are negative shapes, I have the impression that an interior space is being described, when positive then it’s a landscape I am seeing. 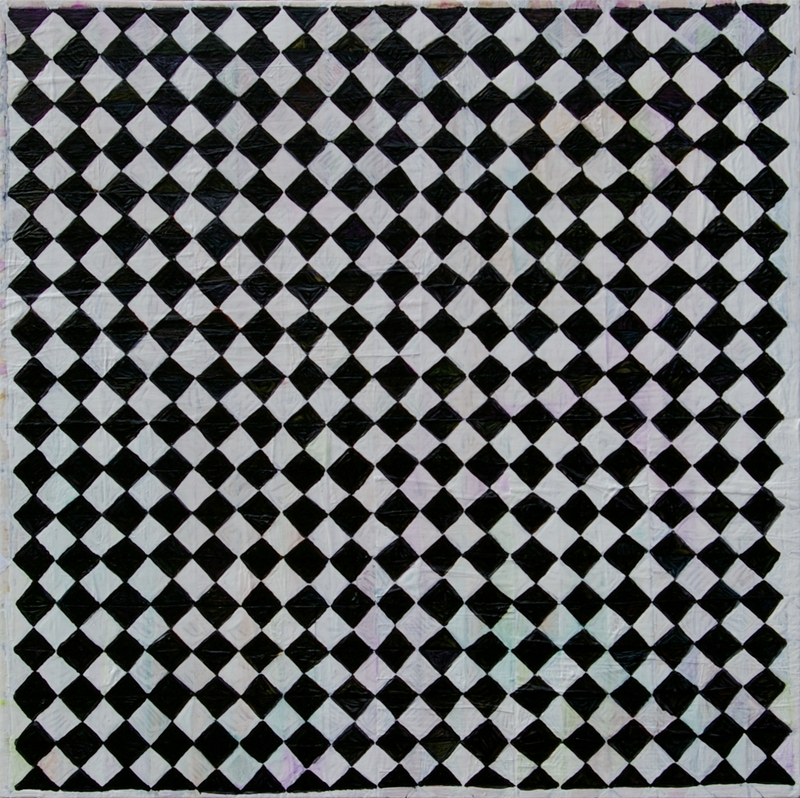 This perceptual shift allows the painting to be viewed first in this way and then in that way and back again, but can never be seen in both ways simultaneously, though the painting holds both views. Perhaps the artist has something of this in mind, when she envisages the cupboard functioning as a Stereoscope, an optical device in which two separate photographic images that have been taken from slightly different viewpoints corresponding to the spacing of the eye, merge together to become a single three-dimensional scene. The device itself being an object of fascination, two flat photographs becoming three-dimensional only when the binocular viewer is brought into operation. There are other ambiguities that come into play also in this charming little painting. 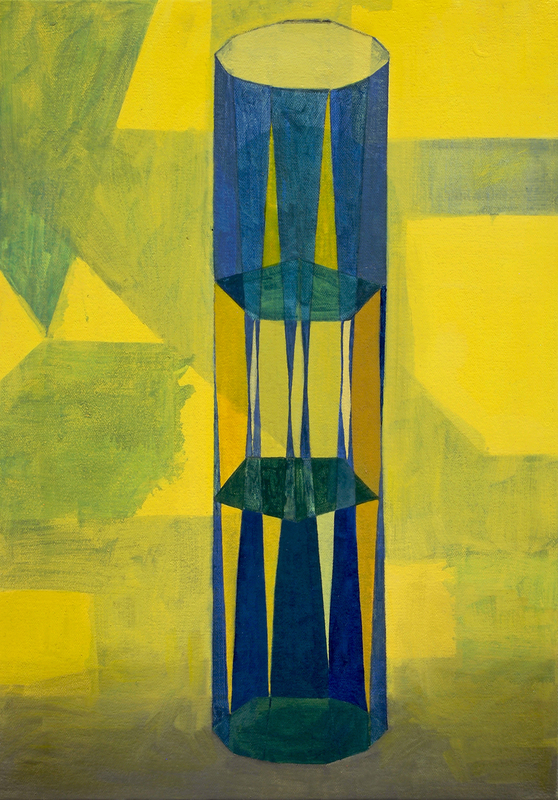 In one viewing the tent figure itself hovers in space, whether the literal space of the support, or the illusionistic space hinted at by the horizon line. The main figure could seem to hover above the horizon or settle down onto the ground that the low horizon line suggests and/or it protrudes slightly in front of the picture plane, and then readjusts back into the framed space. Another alternating reading also asserts itself: the yellow undersides of the lower row of circles/spheres seem to be attached to the triangular figure almost as if they are its wheels, a reading that can be sustained when focusing on the centre of the base and that falls away when focusing more on the edges. The main figure can be interpreted as a vehicle or as an object like the tent of the title, and then fairground associations are triggered for me, in contrast to the Sci Fi associations when I am reading it is a vehicle: a Robot, a Dalek perhaps or a spaceship. All this is further complicated by the formal(ist) abstract ‘language’ of the painting, warning me not to read content into it at all but to see it only as a formal composition of shape and colour. Unveil follows almost the same compositional arrangement as Tent, the space being divided more or less centrally by a horizontal, a vertical and by two diagonal lines, resulting in a positive double triangle shape situated in a negative double triangle space, resembling a pyramid topped by an inverted pyramid, the shape of a ‘double tetractys’. The space has more of a sense of different two-dimensional planes than Tent, becoming more of an illusionistic space in the upper triangular area, as if the flat inverted triangle has opened into a portal onto a three-dimensional space in which an impossible figure rotates. 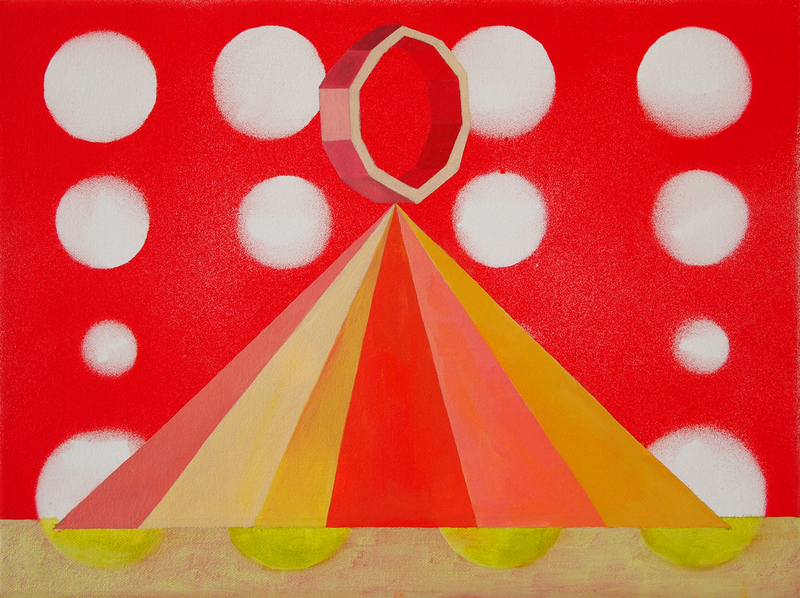 Comparing the two paintings the rotating geometrical figure corresponds to the geometrical ‘ring’ figure in Tent. Both add further spacial ambiguity to each whole. 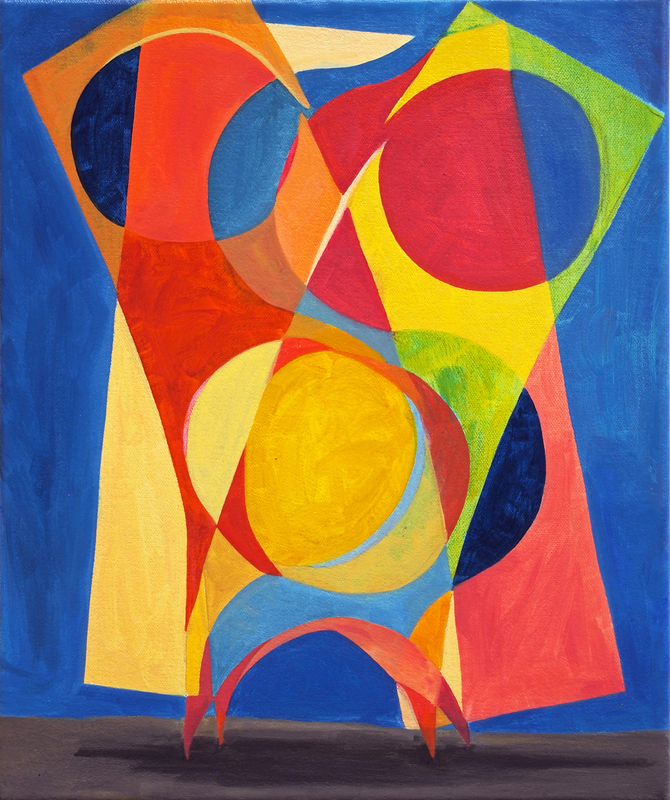 In Unveil, flag like shapes might be interpreted as bunting, adding to a celebratory mood suggested by the joyous colours, that could equally be menacing. I am back at the fairground again where the clowns could be both comedic and terrifying. Yet there are no ‘clowns’ here, no human figures, only coloured triangular and circular forms. There’s something Kandinsky-esque about this painting. Again I want to refer to the formal ‘language’ but I am wondering if the word ‘technology’ might be better, the means employed being derived from the technology of modernist abstraction, and in so far as content is suggested, we have objects and landscapes that are neither natural nor societal but rather technological, which I think I also find in Kandinsky. in Non-Stop Radio and Over the Hill the geometric shapes, like paper cut-outs waving in the air of an unspecified urban park landscape have been anthropomorphised, as if they were dancing figures, with wide shaping at the topline contrasting with the close contact at centre, narrowing down to the feet that look only just strong enough to support the swing and sway above. These constructions could exist only in a painting, whilst looking like they could be fabricated in three dimensions I suspect that an attempt to do so would soon show their impossibility. 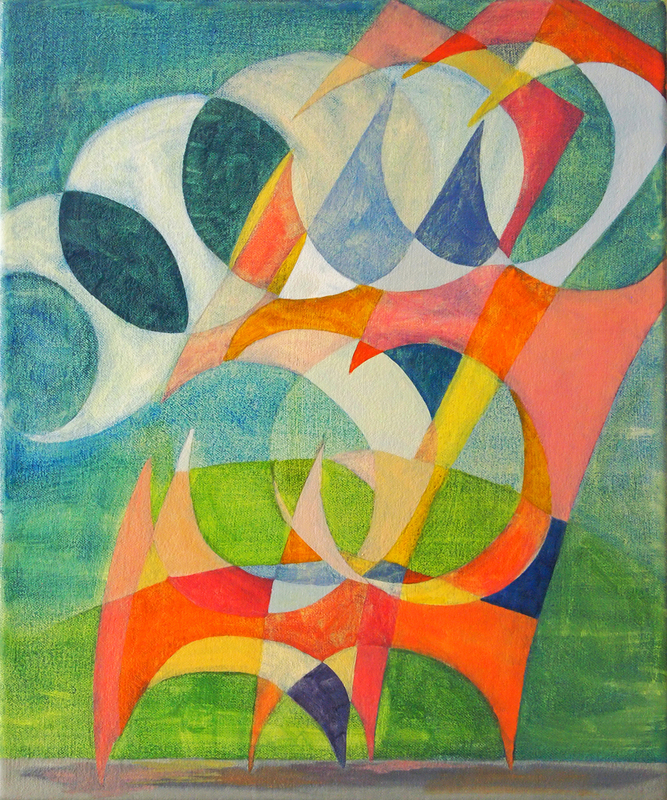 Looking at them, I sense the artist’s enjoyment in imagining them, as well as in painting them, with the lightness of watercolour, the paint handling seems so congruent with these fluid geometries, precise enough, yet never uptight. Timer could be a painting of a real object, something similar to an egg timer, but it isn’t. In fact, it’s an impossible construct, which again I would love to attempt to build. For a start, it looks much too large to be an egg timer, even without paying attention to the differing geometries of the four horizontal intersections. I know I am in danger of coming across like a die-hard Doctor Who fan if I say that it reminds me of the control mechanism of the old style TARDIS, but I just cannot help making that connection. 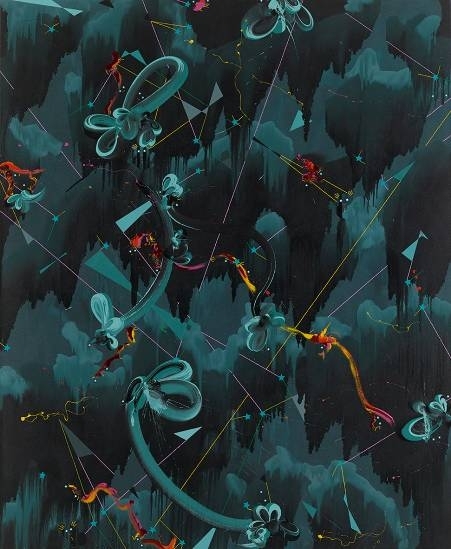 I feel confirmed in my interpretation when I read in the gallery notes that “Chambers’ paintings present alternative universes where impossible science fiction/architectural structures comment on conflicts between our inner dream worlds and the technological robotic control on our everyday lives”. I’d go further and say that our “inner dream worlds” have been technologised, and Doctor Who could serve as an example of that. Maybe it’s a response to the impossibility of the constructions within the paintings that has led to Chambers’ recent experiments in three-dimensions: Rotating Shape Side I and Side II, Shelter and Monument, all of which are here in the cupboard. Shelter and Monument are like nets in the moment of converting from two to three dimensions and Rotating Shape is literally that, a geometric painting on shaped card that can be both rotated and reversed (hence Side I and Side II). 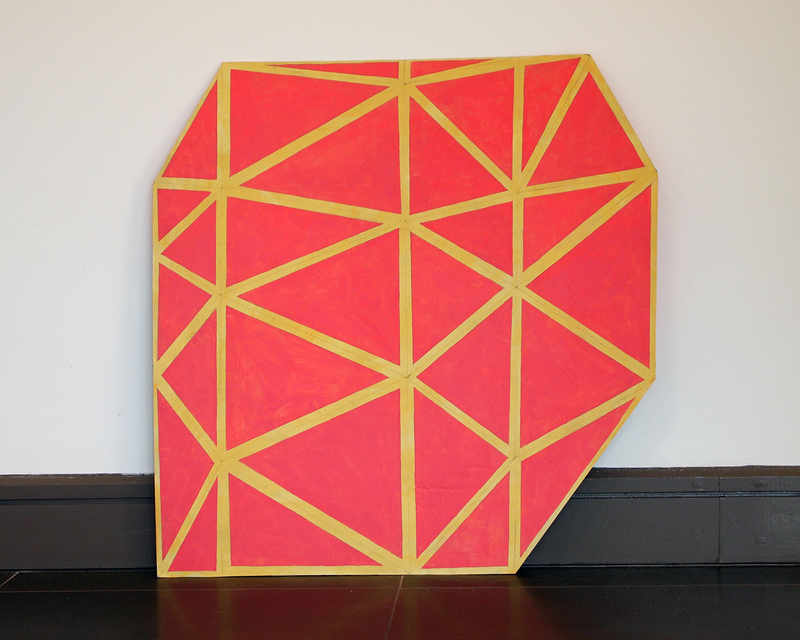 However even these constructible paintings have unconstructability in them, tessalating shapes, bending the space as they shift from one arrangement to another, introducing time as well as space into flat, motionless surfaces. 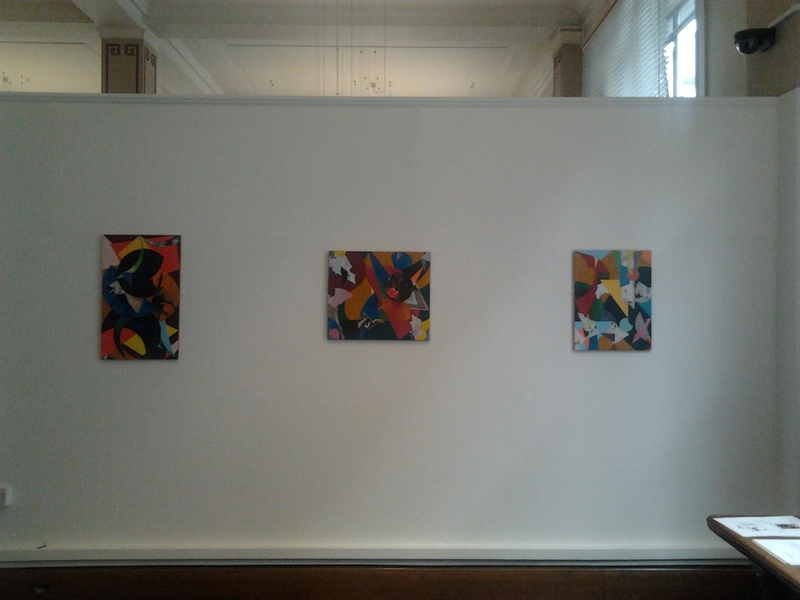 Although Stereoscope closed on 6 December, other paintings by Louisa Chambers can be seen at The Midlands Open at Tarpey Gallery until 11 January and at Crash Open Salon 2013, at Charlie Dutton Gallery from 11 December to 11 January. 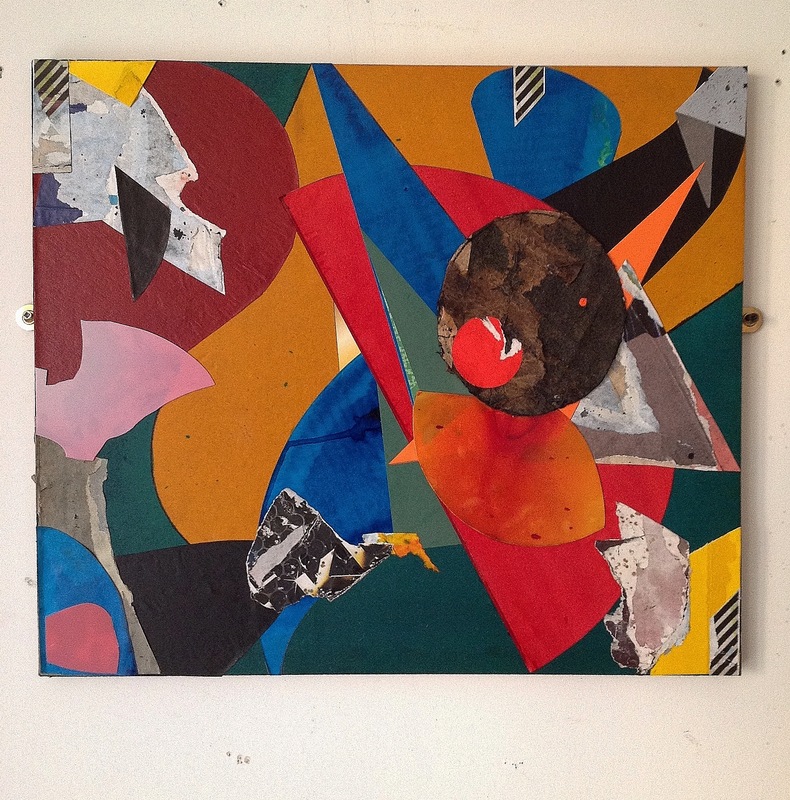 Interview with artist, painter Andy Parkinson | Painters’ Table. I wish I was going too!